As a young gamer in the 70s and 80s, I had an incredibly supportive mother. Our trips shopping always allowed for stops by local bookstores, five-and-dimes and hobby shops to check out the latest Dungeons & Dragons releases, metal miniatures, fan magazines or other gaming delights to add to my growing collection. My mother was also a big yard sale and flea market fan, dragging home all sorts of used games for my brothers and I to try out. One of those early-80s yard sale finds was an unopened copy of 1978’s The DragonLords from Fantasy Games Unlimited. Founded in 1975, FGU is still in business as a publisher of a variety of board and role-playing games. 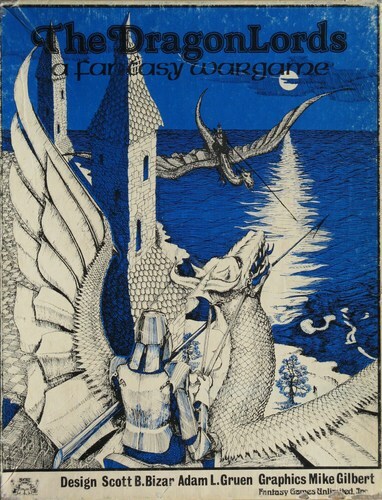 Like many game companies in the mid-70s, FGU leapt into the D&D tidal wave and released a number of fantasy-themed games. 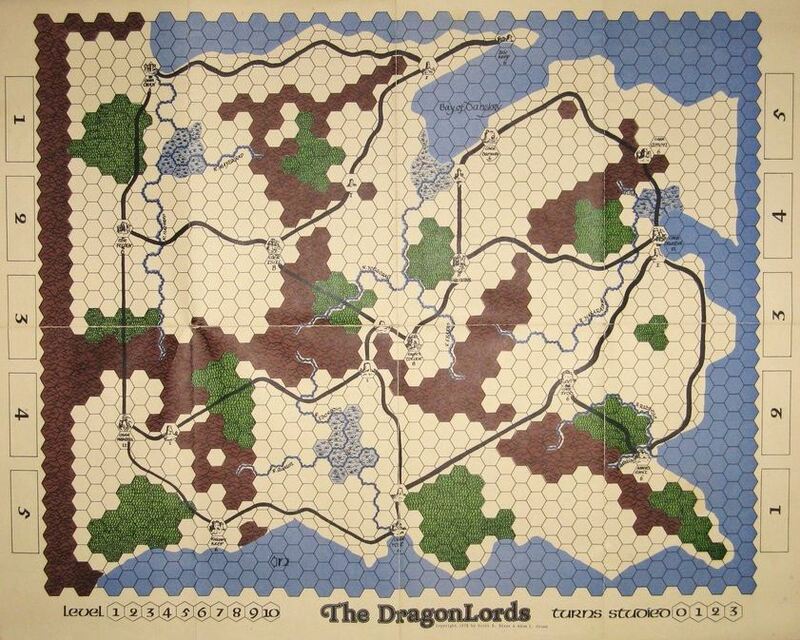 The DragonLords followed the traditional hex map and cardboard counter game model well-established by such publishers as Avalon Hill. The box contained a map, simple rule book, reference sheets and over 600 tiny cardboard playing pieces. The artwork was second-tier generic fantasy illustration, the game map was outright bland and the printing looked like it was done on a typewriter. I loved this game. In The DragonLords, each player took on the guise of a wizard ruling over their kingdom. Players chose to play as a Sorcerer, Conjurer, Enchanter, Necromancer or other type of specialized wizard, each with their own unique set of spells. Spells were acquired through turns “studying,” allowing for more advanced spellcraft in areas such as Siege, Hiring , Weather, Speed or Tactical. By casting their spells, wizards developed armies to fan out across the map to conquer the opposing kindgdom, hasten movement of their own horde or wreak horrible natural disasters on the enemy. For someone well-steeped in D&D and Tolkienesque fantasy, a lot of The DragonLords felt very familiar. Tiny cardboard chips featured very basic line illustrations of elves, giants, trolls, ents, dragons and other creatures, each with values for combat and movement. The wizard spell study mechanic felt akin to the levels of advancement with magic-using characters through Experience points gained in D&D campaigns. Siege of cities and frontier keeps was a key part of the game, and building and attacking with catapults, siege towers and rams was a big component missing from a lot of smaller-scale D&D play. What I loved about The DragonLords at the time was the mix of individual wizard character development and the grander scale of huge grotesque armies slugging it out across the mountains, swamps, forests, roads and waterways of the map. A game could be played satisfactorily in a few hours, also a nice change of pace from the long-term campaigning in D&D. The DragonLords certainly didn’t win any points for its graphics, but for straight fantasy gaming on an epic scale it definitely had its spell cast on me. Collector’s Note: The Dragonlords is long out of print, but with a bit of online searching Iwas able to come across one bagged unpunched copy for over $100 on Amazon.com. Clearly my mother’s yardsale find was quite a deal. Regardless of whether or not the game was even fun or not, the name is really cool. If I were starting a street gang in the 1950’s, I would call them the Dragon Lords.